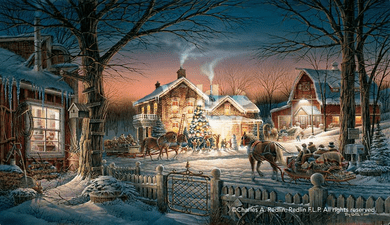 Terry Redlin 2017 Holiday Edition Print:"Trimming the Tree"
About The Art: "In this festive holiday scene, we can almost feel the crisp winter air, hear the children's gleeful shouts, and share in the excited anticipation of arriving visitors. Off to the left, a cat in the lighted window ignores the action outside-she has her eye on a rabbit hiding in the shadows." - Terry Redlin. 2017 Holiday Print; unsigned limited edition of 2,017 art prints made from the original oil painting. Includes printed remarque in lower left margin. Image size, 18-1/2" x 32". Framed size, 29-1/4" x 42-3/4" with 2" medium oak, walnut, or premium finished moulding. Double matting with downpour suede outer mat with mat cut around printed remarque.